How can I convert a table in a Google Docs document to a spreadsheet? I've tried selecting the table in the document, copying it, and pasting into a new spreadsheet, but this results in a one-column spreadsheet with all of the columns flattened into one. I don't see a way to select a single column, or I could potentially copy the table a column at a time (it only has about 13 columns). I only have to do this to one document, so a multi-step process is OK. I just tried it in Chrome on Windows and it works the following way. 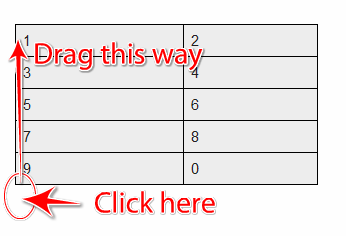 Start selecting the table just below the lower-left cell (click where the cursor changes to the one indicating text entry) and drag the selection all the way up to the top-left cell until all of them are filled with a blueish highlight. Then press CTRL + C, switch to Google Spreadsheet and press CTRL + V.
In the screenshot the highlight is gray because the window was out of focus. I did the following on Windows and it worked. In your google doc, click file and then Download as docx file. Then open it in Word. Select the table in Word and copy it to google spreadsheet. It will keep the format and data. Much better than copy it directly from google doc because it will make all the data go into one column and make it unreadable. EDIT June 2015: sometime in the three+ years since this question was posted, Google has fixed the copy to clipboard functionality; you can now select the table, copy, and paste into a spreadsheet with the expected result. I ended up using the Google Docs "share as an email attachment" function to send it to myself as an .rtf attachment. Opened that in OpenOffice (Word would have worked as well), selected the table, and pasted into an OO spreadsheet. Cleaned up the headings (all the other data transferred fine), and then copied/pasted into the Google spreadsheet. I think I could have skipped the OO spreadsheet step, but didn't test it. Not the answer you're looking for? Browse other questions tagged google-sheets google-docs or ask your own question. How do you move a row in a Google Docs Document table? Is there a way to paste RTF text into Google Document? How to select random data points in Google spreadsheet? What is a cut and paste approach to converting a chunk of a google spreadsheet to markdown table? How to automatically size tables to the entire width of a Google Doc?